Combine 4-6 cups of Ice, 1 (12 oz.) 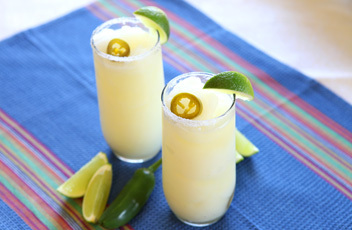 can frozen limeade concentrate, 1 cup tequila and ¼ cup of triple sec into a blender and blend until smooth. Add a splash of Sliced Tamed™ Jalapeño Peppers brine to taste and blend again. Pour into a glass rimmed with salt and garnish with a lime wedge and jalapeño ring.